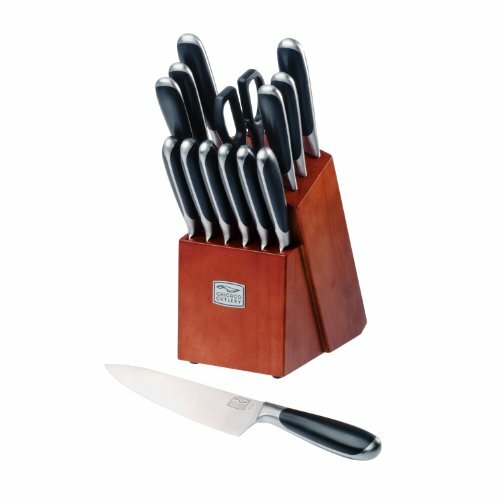 The Chicago Cutlery Belden High-Carbon Stainless Steel Knife Block Set combines attractive contemporary styling and superb quality. Belden 15-piece set includes six (6) 4-1/2-inch serrated steak knives with cherry wood block, two (2) 4-inch paring knives, and one (1) each 8-inch chef, 8-inch bread, 8-inch slicer, 5-1/2-inch utility knife, 3-inch peeler, and shears in a handsome cherry wood block. Blades are made of high-carbon stainless steel for a strong, hard edge for long lasting, precise cutting and easy re-sharpening; high-carbon stainless steel resists stains, rust and pitting. Exclusive 25 Degree Taper Grind edge technology ensures optimum sharpness for precise cutting right out of the box and makes knives easier to re-sharpen. Knives feature forged design for increased weight and balance with full metal tang construction for added strength, balance and control. Handles feature sleek and contemporary styling, with a forged bolster that helps keep fingers from running up the blade, providing excellent balance and increased safety. Lifetime warranty against manufacturer defect.